Bergheim is a village just north of Salzburg with a population of approximately 5,000 residents. It belongs to the Flachgau area or the administrative district of Salzburg-Umgebung. Bergheim is more than a classic commuter village, is has functionally become a suburb of Salzburg. Bergheim′s territory comprises of a typical ice age landscape with forested hills and creeks. Bergheim is an ancient community, its origins can be tracked back to the Palaeolithic Age some 12,000 years ago. It is likely that the area was continuously populated since then: Celtic Illyrians, Romans, later Bavarians. The latter left one of the biggest known cemeteries of their era near the parish church. It was discovered in the late 19th century. In the Middle Ages, the local landlords held high positions at the court of the Prince Archbishop, which resulted in several tax advantages and other privileges for Bergheim. In the course of the Napoleonic Wars, Bergheim was severely damaged by French troops. 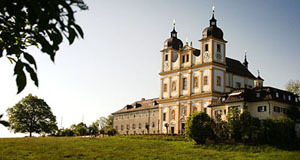 Many international tourists of Austria make it to Bergheim for the Basilica Maria Plain. It is one of the main attractions in the immediate surroundings of the city and the most important church of pilgrimage for the province of Salzburg. It was built in the 17th century and recently renovated - you can approach Maria Plain from two sides, from Bergheim itself or from the Salzburg district of Itzling, where you can get via city busses. Maria Plain is not only a fascinating example of early German Baroque with a Calvary Mount, it is also a wonderful look-out with a view on the Hohensalzburg Castle and the Alps in the background (see our photo gallery for an example). Another noteworthy landmark of Bergheim is the parish church, also in Baroque style. The very high church can be seen from many spots in Salzburg; despite of its style, the church is ancient and its core dates back to the 8th century. The paths from Bergheim′s village centre to Maria Plain are a nice and easy hike. There is an inn right next to the basilica.